The design brief was simple build a support for the rear deck that had a hatch through which the outboard motor could be stored. It also had to be strong enough to walk on. As I wanted the outboard to fit directly onto the transom I had lowered the rear edge of the deck to create an outboard well. This dictated that rear deck either stepped up or sloped up to the rear bulkhead, I chose the latter. The original hatch had been square but I thought that it would look better with rounded corners which could be laminated using agba veneer. The new frame was built using the original rear cross beam incorporated into it. 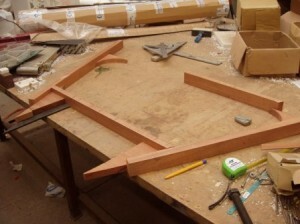 This involved a lot of complex angles to get the construction just right. 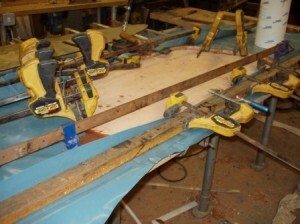 Rebates were routered where necessary to create lands for the deck panels to glue onto. The hatch lip was laminated using strips of agba veneer. I made up plastic clamping blocks that fitted the radius of the corners which allowed the veneer to be clamped tightly when gluing up the laminate. This job was one of many where I used virtually every clamp I had to ensure that the integrity of the assembly was achieved. As it is possible to stand on the hatch lip without a problem it can be said that this was achieved. 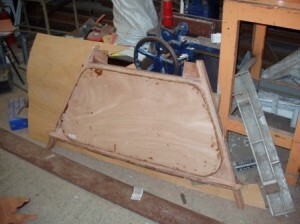 The rear hatch cover was then laminated using a similar method to build a lip around the plywood cover. 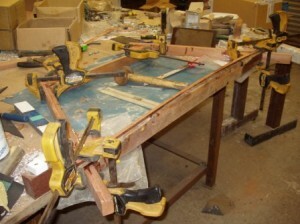 In this case we could staple the laminates around the cover as well as use clamps. To finish it off a strengthening web was glued onto the inside and the whole edge routered with a quarter round bit to give a rolled edge to the cover. Once the two sub assemblies were completed the moment of truth came would they fit each other……. 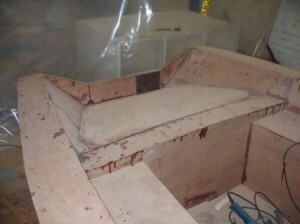 To support the frame a rear bearer and knee were glued into the hull. The original transom may have fallen out but this one will need to take half the boat with it and should ensure that the rear is really stiff. 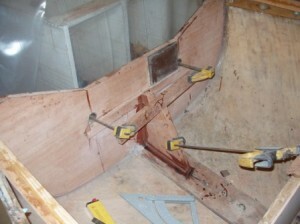 All that remained was to glue the new frame into the stern of the boat and this part of the build would be ready for decking. I must admit that I stood back and admired it quite a lot. As the boat was coming back together this was a recurring problem as the nostalgia from seeing the boat come back to life kicked in. 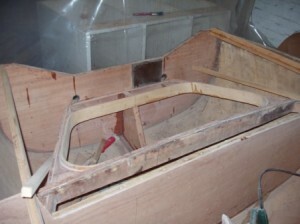 This entry was posted in Alella 2009 rebuild and tagged Alella, Boat Building, Boat repair, Boats by David Townend. Bookmark the permalink.